When I'm making eggs or pasta, I love throwing some thyme or rosemary into my dish. 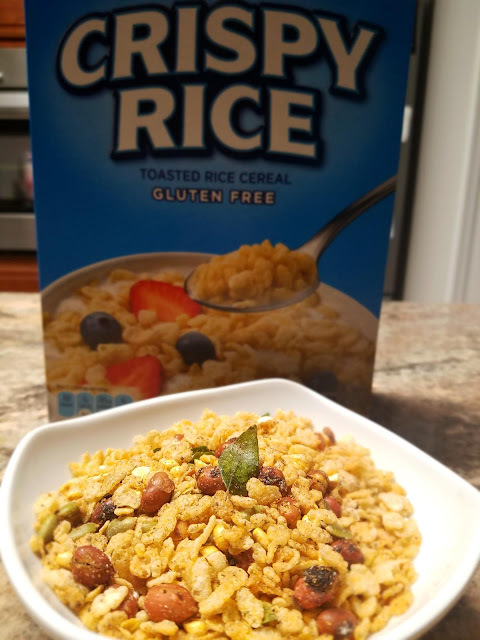 It adds freshness and flavor. It's the same with Indian cooking. We love using mint, coriander, and methi in our dishes. The most common one is coriander; we chop up the leaves and sprinkle them on every one of our vegetable and rice dishes. Another one is methi also known as Fenugreek. This herb can be used fresh or dry and the seeds can be used as a spice. You can even use the fresh leaves or the sprouts as a vegetable in a dish. My sister's friend gave us a few bunches of this herb so we couldn't wait to make something with it. Better to use it while it's fresh! 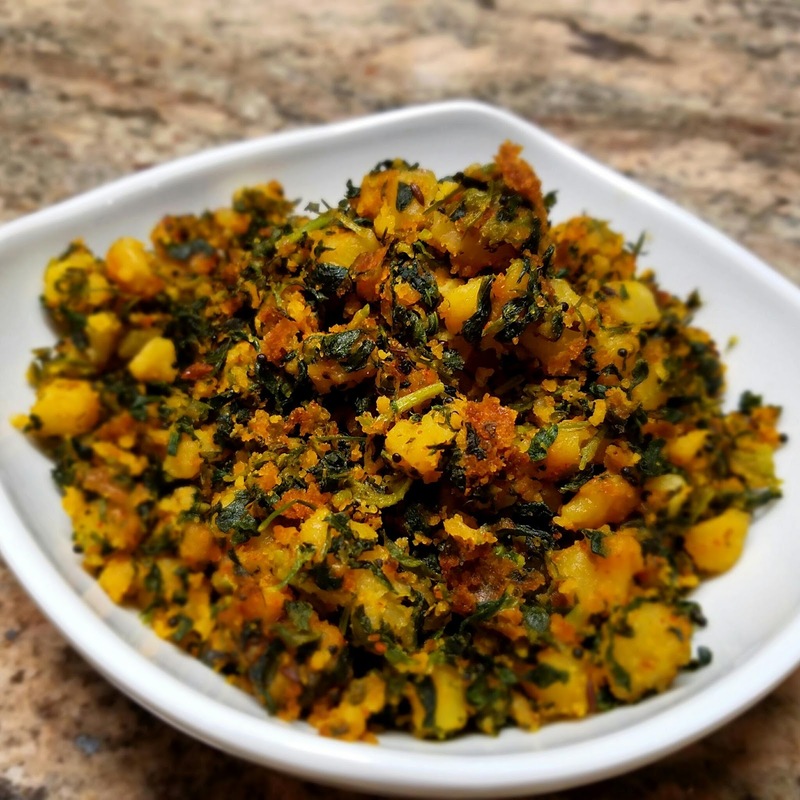 We decided to make Aloo Methi Besan which translates to Potato and Fenugreek leaves with Chickpea flour. Let's see how it's done below. Heat one tablespoon of vegetable oil (on low-medium heat) in a medium saucepan. Next, add mustard and cumin seeds. When they start to splutter, add garlic and stir for 1 to 2 minutes or until they are golden brown. Now add the potatoes and sprinkle a pinch of salt and allow it cook under closed lid for 3 to 4 minutes, stirring intermittently. When the potatoes are soft, add methi leaves and 1/4 teaspoon of salt. Mix and cook for another 3 to 4 minutes. Remove the lid and continue allowing it to cook more until the excess moisture evaporates and the oil comes out. Now add chili powder and stir for another minute. Next add Besan flour, a pinch of salt, and one more tablespoon of vegetable oil. Stir and fry for 2 to 3 minutes under closed lid. When you smell the fried Besan aroma, switch off the heat and remove from stove. Serve with your favorite rice, flatbread or enjoy on its own. I love eating this with yogurt rice and/or roti. How do you incorporate fresh herbs or spices in your cooking? Please share. - If Methi or Fenugreek leaves are not readily available, any leafy green that does relaease too much water when cooked is fine. You can try fresh coriander or kale as well. They will have a different taste. - Besan (Chickpea flour) can be found in most Indian grocery stores. Some Whole Foods stores have it listed as Garbanzo bean flour. Celebrating Navratri on the Eve of Dusshera!